Steve Rowland at the Cambrian Burgess Shale 9000ft in the Canadian Rockies, British Columbia, September 2002. The structural and stereochemical specificity conferred on many organic molecules during biosynthesis is preserved when the compounds are incorporated into sediments. Proof of the structures of such molecules (biological markers) has had such a dramatic impact on petroleum geochemistry that laboratories worldwide are now equipped with the analytical instrumentation necessary for monitoring changes in such compounds. Amongst the most valuable and widely used are a number of acyclic isoprenoid hydrocarbons. Cultures of the diatom Haslea ostrearia: producer of lipids useful to geochemistry and medicine! The first synthesis and complete spectral characterisation (MS, 13C NMR) of a novel C25 isoprenoid alkane and related alkenes was reported by myself and John Robson in Nature and allowed the compounds reported, but not identified, in over fifty other studies to be assigned. Subsequently, C20 and C30 analogues were also synthesised and the synthetic compounds were used to afford a possible explanation of their sedimentary abundance and worldwide distribution. A number of incorrect assignments by US workers, were corrected. The research area increased further in importance to industry with the discovery of the diatom (algal) source of the compounds by Australian workers and their occurrence in Russian and Australian crude oils. Subsequent reports resulted in continued funding which on completion, led to a postdoctoral NERC ROPA award in collaboration with Professor Jean-Michel Robert at the Université de Nantes, France (report rated Scientifically Excellent by NERC reviewers 1999). Invited lectures in the U.S.A., Spain and Australia, followed by a sabbatical year at the CSIRO Marine Laboratories in Australia were accompanied by filing of two provisional patents and numerous publications, describing the uses of the alkenes as biomarkers and as potential anti-tumour agents (see WWW links) and we eventually identified virtually all of the common sedimentary compounds. Owing to their structural and stereochemical specificity, we postulated that these molecules were both potentially valuable diatom markers and that they might prove important to petroleum geochemistry and oceanography as 'biological markers' of algae. We collaborated in a study published in Science (304, 584-587, 2004; DOI) with scientists at the Royal Netherlands Institute for Sea Research (NIOZ) and Stanford University, USA to use these compounds to calibrate the geological clock for the molecular evolution of Rhizosolenid diatoms and we discovered that one of these compounds (a monoene) is made exclusively by species of diatoms that live in sea-ice in both the Arctic and the Antarctic. Thus, the presence of the compound in ancient sediments (at least in the 10,000-year period of the Holocene) now aids the re-construction of the distribution and extent of palaeoice fronts, an important goal of climate research. We have published many papers in Antarctic Science, Earth and Planetary Science Letters, Marine Chemistry Nature Communications and Organic Geochemistry, describing these findings. The resulting sea-ice proxies (IP25 and IPSO25) are widely used in palaeoclimate studies. GC×GC-ToF-MS instrumentation in our air-conditioned laboratories. 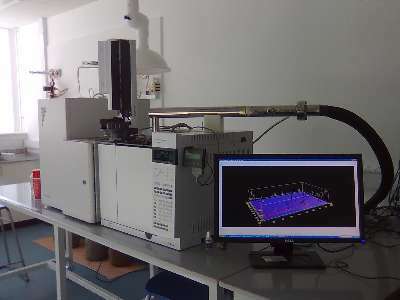 Such equipment allows detailed characterisation of complex mixtures of environmental pollutants. It is astounding, but nonetheless true, that until about 1990 even with sophisticated analytical tools then available, the hydrocarbon composition of the world's major energy source, namely crude oil was virtually unknown. Our report in Nature 1990 that a considerable proportion of these previously unresolved and unidentified hydrocarbons could be characterised by oxidative degradation was met with widespread interest (>150 citations to date). Synthesis, spectral characterisation and oxidation of some of the proposed hydrocarbons supported the conclusions of the initial studies, as did biological oxidation. Development of the methodology to include a quantitative, chemometrics-based analysis of the oxidation products also allowed the 'fingerprinting' of a variety of oils from oil spills and the method was applied to several unpublished oil spill incidents. The work attracted funding from British Petroleum and from the Natural Environment Research Council. The unraveling of crude oil composition has important consequences for both upstream and downstream petroleum industrial activities as well as for pollution studies. Significant in the latter respect is the increased toxicity of the UCM once oxidised. This realisation led to the funding of two further PhD studentships and two postdoctoral fellows by NERC, from which numerous publications resulted, including a paper delivered to the World Congress of the Society for Environmental Toxicology and Chemistry (SETAC) which won the Procter & Gamble Eurocor prize for the best lecture by a young scientist for PhD student Emma Smith and a paper published in Environmental Science and Technology, which was a "most cited" paper in 2007 (see publications). Steve won an Advanced Grant of €2M from the European Research Council to further this research in 2008 and this allowed us to purchase a state-of-the-art comprehensive two-dimensional GC-MS instrument with which we have resolved and identified even previously unresolved polar pollutants, such as naphthenic acids found in the oil sands of Canada and discharged from offshore oil platforms (please see 2011-2016 publications in Environmental Science & Technology and others). 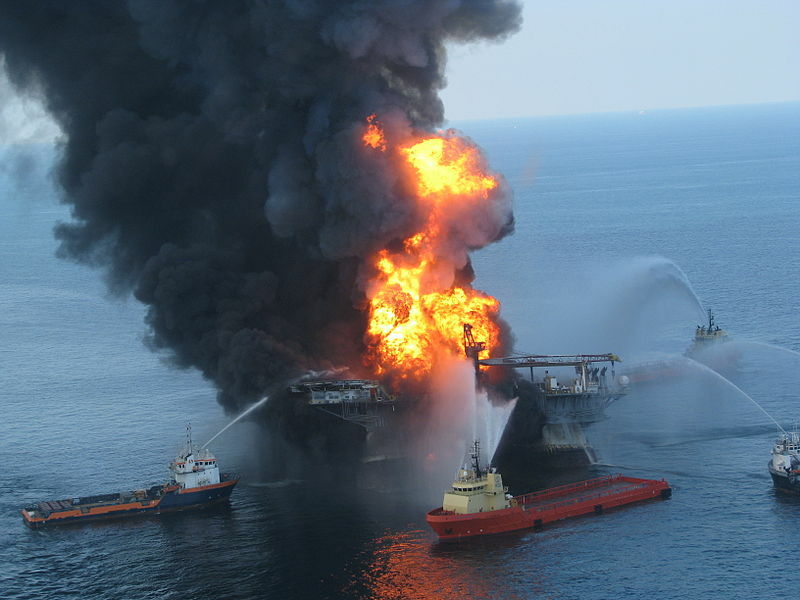 The off-shore oil rig Deepwater Horizon ablaze in the Gulf of Mexico (source). Oil pollution remains a widespread environmental problem as emphasised by the 2010 Macondo Well spill in the Gulf of Mexico. Application of the analytical and biological marker chemistry expertise developed in the foregoing studies to the identification of crude oils spilled in the environment has proved an extremely environmentally valuable exercise over many years and has led to both published and consultancy studies. Differentiation of petroleum-derived and biogenic hydrocarbons in Mussels (Mytilus edulis) from North Sea oil platforms required a revision of previous estimates of pollutant burdens and one of the first identifications of a specific algal source for the biogenic compounds was made. Extension of this careful, compound-specific analytical approach proved valuable for the identification of Nigerian crude oil spilled into the Humber Estuary and of hydrocarbons from the Sullom Voe oil terminal. A fully funded studentship from Kuwait provided instrumentation necessary for a realistic appraisal of the role of solar radiation in the degradation of spilled oil. It is apparent that this process has not been adequately modelled by previous studies and our results indicate that if suitable attention is paid to experimental design, major differences in the degradation rates of oil-derived water-soluble aromatics are observed. The results of these initial studies were presented at an invited lecture to the British Association for the Advancement of Science (Mason lecture). Successive studies were supported by the University, NERC and Plymouth Marine Laboratory including further PhD studentships. An important development has been extension of this approach to an examination of the toxicological importance of the compounds from crude oil. This has revealed that previous research has under estimated a significant environmental burden. This work represents one of the few U.K. studies of molecular changes in spilled oil composition despite the regular occurrence of oil spills of headline proportions (e.g. Braer, Sea Empress). Our studies of the latter have resulted in numerous publications and both research council and industry funds. We are currently studying residues from the Torrey Canyon spill, which are now 50 years old. Discharges of oil production chemicals add to the pollutant burden of the North Sea. Industrial complexes are often situated on estuaries and use these water bodies as convenient discharge points for the dispersal of pollutants. However, many pollutants are hydrophobic and their transport paths are controlled by complex interactions. The fostering of relationships with Plymouth Marine Laboratory and the AstraZeneca Brixham Environmental Laboratory led to industrial support (postdoctoral fellowships and full-time and part-time PhD studentships) for studies into the behaviour and analysis of hydrophobic pollutants in aquatic systems. Our approach focussed on the interactions between hydrophobic pollutants produced by industry and natural humic substances in estuarine waters (the latter obtained in collaboration with Birmingham University). Work focused on the importance of using natural and hence representative humic substances to differentiate from the results of other studies, which used unrealistic commercial humics. Analytical methods developed included pyrolysis-GCMS and LC-MS-MS. Initial results with py-GCMS indicated major differences between humic substances coated onto estuarine particles collected from the Tees in summer compared to those collected in winter. However these results were not reproducible at low organic loadings. This has led us to turn to laboratory-based simulations of particle-organic interactions using 14C labelled pesticides as chemical probes. This approach led to the establishment of important physico-chemical partition data for a whole series of hydrophobic organic chemicals (HOCs) and importantly allowed an industrial problem relating to HOC desorption from soil to be solved. The skills developed led to a major contribution to the NERC LOIS programme based on an assessment of the budget of HOCs in the Humber estuary (see publications). Following successful completion of the LOIS study an application was made to the NERC MIME programme to extend our studies of the physico-chemical properties of HOCs, to chemicals discharged from oil platforms. The aim here was to combine the geochemistry with engineering models to produce a user-friendly management computer model from use of oil platforms. Some £296,000 of RC funds was granted to the Plymouth-led study (PI: S. Rowland) in June 1997 in two programmes of study. Industry contributions to the programme made total funding of this study >£1,000,000. The work was completed in January 2000. The data were incorporated into a detailed hydrological-geochemical-toxicological model (Proteus®) for management of oil platform discharges. Worldwide concern over the effects of estrogenic chemicals in the environment led to three studies funded by the Environment Agency and AstraZeneca, designed to examine the origins of such chemicals in sewage treatment works effluents. The results of these studies (Niven PhD, 2000) are now published (see publications). After ~35 years in organic geochemistry research, at 63 I am currently Professor of Organic Geochemistry, head of the Petroleum and Environmental Geochemistry Group and co-Director of the Biogeochemistry Research Centre at the University of Plymouth. In that time I have published over 200 papers and supervised over 35 PhD students. I have obtained many research grants and carried out a considerable amount of commissioned work for external agencies. I was an undergraduate at the University of Bristol and returned there as a postgraduate following 2 years industrial experience. After completing my PhD under the supervision of Professor James Maxwell FRS, I undertook postdoctoral research with Professor Bob Alexander at Curtin University, Western Australia and then as a British Petroleum fellow at the University of Newcastle with the late Dr Archie Douglas. I was appointed to a lectureship at Plymouth in 1984, a Readership in 1989 and awarded a personal chair in 1993. I was a member of the MRC Institute of Environment and Health working group on Estrogenic Chemicals in the Environment in 1996 and a Visiting Professor at the CSIRO Marine Laboratory in Hobart, Tasmania in 1997/8, sponsored by The Royal Society and British Council. From 1996 to 2004, I was an Associate Editor of the leading Elsevier international organic geochemistry journal, Organic Geochemistry and from 1993 to 2001 I was a full board member and Membership Officer of the European Association of Organic Geochemists. I am also a Fellow of the Royal Society of Chemistry, a past Chair and committee member of the Royal Society of Chemistry (Peninsula Section) and a member of the Association of Chemistry and the Environment. I was a member of the international judging panel of the Kuwait Science prize ($1,000,000) in December 2002. In 2005 I was awarded a Blaustein Fellowship by the School of Earth Sciences at Stanford University, California, USA. I also visited the University of Calgary in August 2005 supported by a Royal Society Short Term Visit Award. In 2007 I gave the opening plenary lecture at the 23rd International Meeting on Organic Geochemistry in Torquay, U.K. (audience 550) and was invited to deliver a plenary lecture at the 2008 International Meeting of Australian Association of Organic Geochemists in Adelaide, Australia and again in 2016. I have been a consultant to oilfield specialists Oil Plus Ltd, Newbury, U.K., on naphthenic acid chemistry and to the U.K. Foreign & Commonwealth Office on forensic oil identification methods (2007-2008) and counter proliferation efforts (April 2016). I was a member of the Natural Environment Research Council (NERC) Peer Review College, NERC Life Sciences Mass Spectrometry Committee and NERC Services Review Group and of the Science Foundation Ireland Geosciences Review Panel. I won the "Making Plymouth Great" Business Ideas Challenge in 2007 and an ERC €2M Advanced Investigators Grant in 2009. The Biogeochemistry Research Centre, of which I am co-Director won the Vice-Chancellor's award for Best Research Team in 2011. Since the University was, until 2011, the National Centre for teaching in Environmental Sciences (https://www.gees.ac.uk), it is perhaps unsurprising that much of my teaching covered aspects of environmental organic chemistry. Other areas included analytical and biological organic chemistry for both undergraduate and postgraduate courses (BSc (Hons) Chemistry, Centre for Chemical Sciences; BSc (Hons) Environmental Science; MSc Applied Marine Science). In addition, I was involved in the production of new teaching material which focused on the use of computer-aided learning (CAL). In 2007 I authored a successful appeal to HEFCE for an award to the Centre for Chemical Sciences of £256,000 funds for the promotion of undergraduate chemistry at the University of Plymouth. I also prepared teaching material for the "Chemistry for Our Future" initiative administered by the Royal Society of Chemistry. Aitken, C.M., Head, I.M., Jones, D.M., Rowland, S.J., Scarlett, A.G. and West, C.E. Comprehensive two-dimensional gas chromatography-mass spectrometry of complex mixtures of anaerobic bacterial metabolites of petroleum hydrocarbons. Journal of Chromatography A (In press) . [doi: 10.1016/j.chroma.2017.06.027]. Rowland, S.J., Sutton, P.A., Belt, S.T., Fitzsimmons-Thoss, V. and Scarlet, A.G. Further spectral and chromatographic studies of ambergris. Natural Product Research. (Submitted) . [doi: 10.1080/14786419.2018.1428599]. Dogra, Y., Scarlett, A.G., Rowe, D., Galloway, T.S. and Rowland, S.J. (2018) Predicted and measured acute toxicity and developmental abnormalities in zebrafish embryos produced by exposure to individual aromatic acids. Chemosphere 205 98-107. [doi: 10.1016/j.chemosphere.2018.04.079]. Edwards, D.S., McKirdy, D.M., Rowland, S.J., Heath, D.J. and Gray, P.S. (2018) Waxy bitumen stranding in southern Australia: A geochemical study of multiple oil families and their likely origins. Organic Geochemistry 118, 132-151. [doi: 10.1016/j.orggeochem.2017.12.010]. Samanipour, S., Baz-Lomba, J.A., Reid, M.J., Ciceri, E., Rowland, S., Nilsson, P. and Thomas, K.V. (2018) Assessing sample extraction efficiencies for the analysis of complex unresolved mixtures of organic pollutants: A comprehensive non-target approach. Analytica Chimica Acta 1025, 92-98. [doi: 10.1016/j.aca.2018.04.020]. Wilde, M.J. and Rowland, S.J. (2018) Naphthenic acids in oil sands process waters: Identification by conversion of the acids or esters to hydrocarbons. Organic Geochemistry 115, 188-196. [doi: 10.1016/j.orggeochem.2017.09.004]. Peterson, K., Hultman, M.T., Rowland, S.J. and Tollefsen, K.E. (2017) Toxicity of organic compounds from unresolved complex mixtures (UCMs) to primary fish hepatocytes. Aquatic Toxicology 190C, 150-161. [doi: 10.1016/j.aquatox.2017.06.007]. Rowland, S.J. and Sutton, P.A. (2017) Chromatographic and spectral studies of jetsam and archived ambergris. Natural Product Research 31, 1752-1757. [doi: 10.1080/14786419.2017.1290618]. Robson, W.J., Sutton, P.A., McCormack, P., Chilcott, N.P. and Rowland, S.J. (2017) Class type separation of the polar and apolar components of petroleum. Analytical Chemistry 89, 2919-2927. [doi: 10.1021/acs.analchem.6b04202]. Belt, S.T., Smik, L., Brown, T.A., Kim, J.-H., Rowland, S.J., Allen, C.S., Gal, J.-K., Shin, K.-H., Lee, J.I. and Taylor, K.W.R. (2016) Source identification and distribution reveals the potential of the geochemical Antarctic sea ice proxy IPSO25. Nature Communications 7:12655. [doi: 10.1038/ncomms12655]. Frank, R.A., Milestone, C.B., Rowland, S.J., Headley, J.V., Kavanagh, R.J., Lengger, S.K., Scarlett, A.G., West, C.E., Peru, K.M. and Hewitt, L.M. (2016) Assessing spatial and temporal variability of acid-extractable organics in oil sands process-affected waters. Chemosphere 160, 303-313. [doi: 10.1016/j.chemosphere.2016.06.093]. Jonker, M.T.O., Candido, A., Vrabie, C.M., Scarlett, A.G. and Rowland, S.J. (2016) Synergistic androgenic effect of a petroleum product caused by the joint action of at least three different types of compounds. Chemosphere 144, 1142-1147. [doi: 10.1016/j.chemosphere.2015.09.094]. Sutton, P.A. and Rowland, S.J. (2016) Spectral and chromatographic characterisation of the onoceroid, ambrane: A potential novel biological marker. Organic Geochemistry 102, 106-109. [doi: 10.1016/j.orggeochem.2016.10.007]. Xiao-Lei Liu, Birgel, D., Elling, F.J., Sutton, P.A., Lipp, J.S., Rong Zhu, Chuanlun Zhang, Könneke, M., Peckmann, J., Rowland, S.J., Summons, R.E. and Hinrichs, K.-U. (2016) From ether to acid: A plausible degradation pathway of glycerol dialkyl glycerol tetraethers. Geochimica Cosmochimica Acta 183, 138-152. [doi: 10.1016/j.gca.2016.04.016]. Lengger, S.K., Scarlett A.G., West C.E., Frank R.A., Hewitt L.M., Milestone C.B. and Rowland S.J. (2015) Use of the distributions of adamantane acids to profile short-term temporal and pond-scale spatial variations in the composition of oil sands process-affected waters. Environmental Science: Processes & Impacts 17, 1415-1423. [doi: 10.1039/c5em00287g]. Napper, I.E., Bakir, A., Rowland, S.J. and Thompson, R.C. (2015) Characterisation, quantity and sorptive properties of microplastics extracted from cosmetics. Marine Pollution Bulletin 99, 178-185. [doi: 10.1016/j.marpolbul.2015.07.029]. Swigert, J.P., Lee, C., Wong, D.C.L., White, R., Scarlett, A.G., West, C.E. and Rowland, S.J. (2015) Aquatic hazard assessment of a commercial sample of naphthenic acids. Chemosphere 124, 1-9. [doi: 10.1016/j.chemosphere.2014.10.052]. Wilde, M. and Rowland, S.J. (2015) Structural identification of petroleum acids by conversion to hydrocarbons and multidimensional gas chromatography-mass spectrometry. Analytical Chemistry 87, 8457-8465. [doi: 10.1021/acs.analchem.5b01865]. Wilde M.J., West C.E., Scarlett A.G., Jones D., Frank R.A., Hewitt L.M. and Rowland S.J. (2015) Bicyclic naphthenic acids in oil sands process water: Identification by comprehensive multidimensional gas chromatography–mass spectrometry. Journal of Chromatography A 1378, 74-87. [doi: 10.1016/j.chroma.2014.12.008]. Bakir, A., Rowland, S.J. and Thompson, R.C. (2014) Transport of persistent organic pollutants by microplastics in estuarine conditions. Estuarine, Coastal and Shelf Science 140, 14-21. [doi: 10.1016/j.ecss.2014.01.004]. Frank, R.A., Roy, J.W., Bickerton, G., Rowland, S.J., Headley, J.V., Scarlett, A.G., West, C.E., Peru, K.M., Parrott, J.L., Conly, F.M. and Hewitt, L.M. (2014) Profiling oil sands mixtures from industrial developments and natural groundwaters for source identification. Environmental Science & Technology 48, 2660-2670. [doi: 10.1021/es500131k]. Rowland, S.J., Pereira, A.S., Martin, J.W., Scarlett, A.G., West, C.E., Lengger, S.K., Wilde, M.J., Pureveen, J., Tegelaar, E.W., Frank, R.A. and Hewitt, L.M. (2014) Mass spectral characterisation of a polar, esterified fraction of an organic extract of an oil sands process water. Rapid Communications in Mass Spectrometry 28, 2352-2362. [doi: 10.1002/rcm.7024]. Sutton, P.A. and Rowland, S.J. (2014) Determination of the content of C80 tetraacids in petroleum. Energy & Fuels 28, 5657-5669. [doi: 10.1021/ef5012337]. West, C.E., Pureveen, J., Scarlett, A.G., Lengger, S.K., Wilde, M.J., Korndorffer, F., Tegelaar, E.W. and Rowland, S.J. (2014) Can two-dimensional gas chromatography/mass spectrometric identification of bicyclic aromatic acids in petroleum fractions help to reveal further details of aromatic hydrocarbon biotransformation pathways? Rapid Communications in Mass Spectrometry 28, 1023-1032. [doi: 10.1002/rcm.6876]. West, C.E., Scarlett, A.G., Tonkin, A., O'Carroll-Fitzpatrick, D., Pureveen, J., Tegelaar, E., Gieleciak, R., Hager, D., Petersen, K., Tollefsen, K.-E. and Rowland, S.J. (2014) Diaromatic sulfur-containing 'naphthenic' acids in process waters. Water Research 51, 206-215. [doi: 10.1016/j.watres.2013.10.058]. Alam, M.S, West, C.E., Scarlett, A.G., Rowland, S.J. and Harrison, R.M. (2013) Application of 2D-GCMS reveals many industrial chemicals in airborne particulate matter. Atmospheric Environment 65, 101-111. [doi: 10.1016/j.cub.2013.10.012]. Bakir, A., Rowland, S.J. and Thompson, R.C. (2014) Enhanced desorption of persistent organic pollutants from microplastics under simulated physiological conditions. Environmental Pollution 185, 16-23. [doi: 10.1016/j.envpol.2013.10.007]. Browne, M.A., Niven, S.J., Galloway, T.S., Rowland, S.J. and Thompson, R.C. (2013) Microplastic moves pollutants and additives to worms, reducing functions linked to health and biodiversity. Current Biology 23, 2388-2392. [doi: 10.1016/j.cub.2013.10.012]. Downes-Tettmar, N., Rowland, S., Widdicombe, C., Woodward, M. and Llewellyn, C. (2013) Seasonal variation in Pseudo-nitzschia spp. and domoic acid in the Western English Channel. Continental Shelf Research 53, 40-49. [doi: 10.1016/j.csr.2012.10.011]. Johnson R.J., Smith, B.E., Rowland, S.J. and Whitby, C. (2013) Biodegradation of alkylbranched aromatic alkanoic naphthenic acids by Pseudonomas putida KT2440. International Biodeterioration & Biodegradation 81, 3-8. [doi: 10.1016/j.ibiod.2011.11.008]. Jones, D., Scarlett, A.G., West, C.E., Frank, R.A. Gieleciak, R., Hager, D., Pureveen, J., Tegelaar, E. and Rowland, S.J. (2013) Elemental and spectroscopic characterisation of fractions of an acidic extract of oil sands process water. Chemosphere 93, 1655-1664. [doi: 10.1016/j.chemosphere.2013.03.011]. Lengger, S.K., Scarlett, A.G., West, C.E. and Rowland, S.J. (2013) Diamondoid diacids ('O4' species) in oil sands process-affected water. Rapid Communications in Mass Spectrometry 27, 2648-2654. [doi: 10.1002/rcm.6729]. Reinardy, H.C., Scarlett, A.G., Henry, T.B., West, C.E., Hewitt, L.M., Frank, R.A. and Rowland, S.J. (2013) Aromatic naphthenic acids in oil sands process-affected water, resolved by GCxGC-MS, only weakly induce the gene for vitellogenin production in zebrafish (Danio rerio) larvae. Environmental Science & Technology 47, 6614-6620. [doi: 10.1021/es304799m]. Scarlett, A.G., Reinardy, H.C., Henry, T.B., West, C.E., Frank, R.A., Hewitt, L.M. and Rowland, S.J. (2013) Acute toxicity of aromatic and non-aromatic fractions of naphthenic acids extracted from oil sands process-affected water to larval zebrafish. Chemosphere 93, 415-420. [doi: 10.1016/j.chemosphere.2013.05.020]. Sutton, P.A., Wilde, M.J., Martin, S.J., Cvacka, J. and Rowland, S.J. (2013) Studies of long chain lipids in insects by high temperature gas chromatography and high temperature gas chromatography-mass spectrometry. Journal of Chromatography A. 1297, 236-240. [doi: 10.1016/j.chroma.2013.05.006]. West, C.E., Scarlett, A.G., Pureveen, J., Tegelaar, E. and Rowland, S.J. (2013) Abundant naphthenic acids in oil sands process-affected water: Studies by synthesis, derivatisation and two-dimensional gas chromatography/high-resolution mass spectrometry. Rapid Communications in Mass Spectrometry 27, 357-365. [doi: 10.1002/rcm.6452]. Bakir, A., Rowland S.J. and Thompson R.C. (2012) Competitive sorption of persistent organic pollutants onto microplastics in the marine environment. Marine Pollution Bulletin 64, 2782-2789. [doi: 10.1016/j.marpolbul.2012.09.010]. Johnson R.J., West C.E., Swaih A.M., Folwell B.D., Smith B.E., Rowland, S.J. and Whitby, C. (2012) Aerobic biotransformation of alkyl branched aromatic alkanoic naphthenic acids via two different pathways by a new isolate of Mycobacterium Environmental Microbiology 14, 872-882. [doi: 10.1111/j.1462-2920.2011.02649.x]. Jones, D., West, C.E., Scarlett, A.G., Frank, R.A. and Rowland, S.J. (2012) Isolation and estimation of the 'aromatic' naphthenic acid content of an oil sands process-affected water extract. Journal of Chromatography A 1247, 171-175. [doi: 10.1016/j.chroma.2012.05.073]. Rowland, S.J., West, C.E., Scarlett, A.G., Cheuk Ho and Jones, D. (2012) Differentiation of two industrial oil sands process-affected waters by two-dimensional gas chromatography/mass spectrometry of diamondoid acid profiles. Rapid Communications in Mass Spectrometry 26, 572-576. [doi: 10.1002/rcm.6138]. Scarlett, A.G., West, C.E., Jones, D., Galloway, T.S and Rowland, S.J. (2012) Predicted toxicity of naphthenic acids present in oil sands process-affected waters to a range of environmental and human endpoints. Science of the Total Environment 425, 119-127. [doi: 10.1016/j.scitotenv.2012.02.064]. Sutton, P.A. and Rowland, S.J. (2012) High temperature gas chromatography-time-of-flight-mass spectrometry (HTGC-ToF-MS) for high-boiling compounds. Journal of Chromatography A. 1243, 69-80. [doi: 10.1016/j.chroma.2012.04.044]. Tollefsen, K.E., Petersen, K. and Rowland, S.J. (20112) Toxicity of synthetic naphthenic acids to rainbow trout liver cells. Environmental Science & Technology 46, 5143-5150. [doi: 10.1021/es204124w]. West, C.E. and Rowland S.J. (2012) Aqueous phototransformation of diazepam and related human metabolites under simulated sunlight. Environmental Science & Technology 46, 4749-4756. [doi: 10.1021/es203529z]. Johnson, R.J., Smith, B.E., Sutton, P.A., McGenity, T.J., Rowland, S. and Whitby, C. (2011) Microbial biodegradation of aromatic alkanoic naphthenic acids is affected by the degree of alkyl side chain branching. ISME Journal 5, 486-496. [doi: 10.1038/ismej.2010.146]. Jones, D., Scarlett, A.G., West, C.E. and Rowland, S.J. 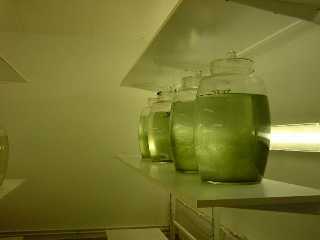 (2011) Toxicity of individual naphthenic acids to Vibrio fisheri. Environmental Science & Technology 45, 9776-9782. [doi: 10.1021/es201948j]. Massé, G., Belt, S.T., Crosta, X., Schmidt, S., Snape, I., Thomas, D.N. and Rowland, S.J. (2011) Highly branched isoprenoids as proxies for variable sea ice conditions in the Southern Ocean. Antarctic Science 23, 487-498. [doi: 10.1017/S0954102011000381]. Rowland, S.J., Clough, R., West, C.E., Scarlett, A.G., Jones, D. and Thompson, S. (2011) Synthesis and mass spectrometry of some tri- and tetracyclic naphthenic acids. Rapid Communications in Mass Spectrometry 25, 2573-2578. [doi: 10.1002/rcm.5153]. Rowland, S.J., Jones, D., Scarlett, A.G., West, C.E., Liu Pok Hin, Boberek, M., Tonkin, A., Smith, B.E. and Whitby, C. (2011) Synthesis and toxicity of some metabolites of the microbial degradation of synthetic naphthenic acids. Science of the Total Environment 409, 2936-2941. [doi: 10.1016/j.scitotenv.2011.04.012]. Rowland, S.J., Scarlett, A.G., Jones, D., West, C.E. and Frank, R.A. (2011) Diamonds in the rough: Identification of individual naphthenic acids in oil sands process water. Environmental Science & Technology 45, 3154-3159. [doi: 10.1021/es103721b]. This paper has been selected by ACS Environmental Science & Technology journal Editor-in-Chief Jerry Schnoor to appear additionally in a special online-only virtual issue entitled "Water-Energy Nexus" aimed at the scientifically literate general public. Rowland, S.J., West, C.E., Scarlett, A.G. and Jones, D. (2011) Identification of individual acids in a commercial sample of naphthenic acids from petroleum by two dimensional comprehensive gas chromatography-mass spectrometry. Rapid Communications in Mass Spectrometry 25, 1741-1751. [doi: 10.1002/rcm.5040]. Rowland, S.J., West, C.E., Scarlett, A.G., Jones, D., Boberek, M., Pan, L., Ng, M., Kwong, L. and Tonkin, A. (2011) Monocyclic and monoaromatic naphthenic acids: Synthesis & characterisation. Environmental Chemistry Letters 9, 525-533. [doi: 10.1007/s10311-011-0314-6]. Rowland, S.J., West, C.E., Scarlett, A.G., Jones, D. and Frank, R.A. (2011) Identification of individual tetra- and pentacyclic naphthenic acids in oil sands process water by comprehensive two-dimensional gas chromatography-mass spectrometry. Rapid Communications in Mass Spectrometry 25, 1198-1204. [doi: 10.1002/rcm.4977]. Rowland, S.J., West, C.E., Scarlett, A.G., Jones, D., Frank. R. and Hewitt, L.M. (2011) Steroidal aromatic 'naphthenic acids' in oil sands process-affected water: Structural comparisons with environmental estrogens. Environmental Science & Technology 45, 9806-9815. [doi: 10.1021/es202606d]. West, C.E., Jones, D., Scarlett, A.G. and Rowland, S.J. (2011) Compositional heterogeneity may limit the usefulness of some commercial naphthenic acids for toxicity assays. Science of the Total Environment 409, 4125-4131. [doi: 10.1016/j.scitotenv.2011.05.061]. Frenzel, M., Scarlett A., Rowland, S.J., Galloway T.S., Burton, S.K., Lappin-Scott, H.M. and Booth A.M. (2010) Complications with remediation strategies involving the biodegradation and detoxification of recalcitrant contaminant aromatic hydrocarbons. Science of the Total Environment 408, 4093-4101. [doi: 10.1016/j.scitotenv.2010.04.042]. Sutton, P.A., Smith, B.E. and Rowland, S.J. (2010) Mass spectrometry of polycyclic tetracarboxylic ('ARN') acids and tetramethyl esters. Rapid Communications in Mass Spectrometry 24, 3195-3204. [doi: 10.1002/rcm.4761]. Sutton, P.A., Smith, B.E., Waters, D. and Rowland, S.J. (2010) Identification of a novel ester obtained during isolation of C80 ("ARN") tetraprotic acids from an oilfield pipeline deposit. Energy Fuels 24, 5579-5585. [doi: 10.1021/ef1008743]. Frenzel, M., James, P., Burton, S.K., Rowland, S.J. and Lappin-Scott, H.M. (2009) Towards bioremediation of toxic unresolved complex mixtures of hydrocarbons: identification of bacteria capable of rapid degradation of alkyltetralins. Journal of Soils & Sediments 9, 129-136. [doi: 10.1007/s11368-009-0070-4]. Melbye, A.G., Brakstad, O.G., Hokstad, J.N., Gregersen, I.K., Hansen, B.H., Booth, A.M., Rowland, S.J. and Tollefsen, K.E. (2009) Chemical and toxicological characterization of an unresolved complex mixture-rich biodegraded crude oil. Environmental Toxicology and Chemistry 28, 1815-1824. [doi: 10.1897/08-545.1]. Scarlett, A., Dissanayake, A., Galloway, T.S. and Rowland, S.J. (2009) Behavioural, physiological and cellular responses following trophic transfer of toxic monoaromatic hydrocarbons. Environmental Toxicology and Chemistry 28, 381-387. [doi: 10.1897/08-298.1]. Teuten, E.L., Saquing, J.M., Knappe, D.R.U., Barlaz, M.A., Jonsson, S., Björn, A., Rowland, S.J., Thompson, R.C., Galloway, T.S., Yamashita, R., Ochi, D., Watanuki, Y., Moore, C., Viet, P.H., Tana, T.S., Prudente, M., Boonyatumanond, R., Zakaria, M.P., Akkhavong, K., Ogata, Y., Hirai, H., Iwasa, S., Mizukawa, K., Hagino, Y., Imamura, A., Saha, M. and Takada, H. (2009) Transport and release of chemicals from plastics to the environment and to wildlife. Philosophical Transactions of the Royal Society B: Biological Sciences 364, 2027-2045. [doi: 10.1098/rstb.2008.0284]. Belt, S.T., Massé, G., Vare, L.L., Rowland, S.J., Poulin, M., Sicre, M.-A., Sampei, M. and Fortier, L. (2008) Distinctive 13C isotopic signature distinguishes a novel sea ice biomarker in Arctic sediments and sediment traps. Marine Chemistry 112, 158-167. [doi: 10.1016/j.marchem.2008.09.002]. Massé, G., Rowland, S.J., Sicre, M.-A., Jacob, J., Jansen, E. and Belt, S.T. (2008) Abrupt climate changes for Iceland during the last millennium: Evidence from high resolution sea ice reconstructions. Earth Planetary Science Letters 269, 564-568. [doi: 10.1016/j.epsl.2008.03.017]. Redshaw, C.H., Cooke, M.P., Talbot, H.M., McGrath, S. and Rowland, S.J. (2008) Low biodegradability of fluoxetine HCl, diazepam and their human metabolites in sewage sludge-amended soil. Journal of Soils & Sediments 8, 217-230. [doi: 10.1007/s11368-008-0024-2]. Redshaw, C.H., Wootton, V. and Rowland, S.J. (2008) Uptake of the pharmaceutical Fluoxetine Hydrochloride from growth medium by Brassicaceae. Phytochemistry 69, 2510-2516. [doi: 10.1016/j.phytochem.2008.06.018]. Scarlett, A., Rowland, S.J., Galloway, T.S., Lewis, A.C. and Booth, A.M. (2008) Chronic sublethal effects associated with branched alkylbenzenes bioaccumulated by mussels. Environmental Toxicology and Chemistry 27, 561-567. [doi: 10.1897/07-347.1]. Smith, B.E. and Rowland, S.J. (2008) A derivatisation and liquid chromatography/electrospray ionisation multistage mass spectrometry method for the characterisation of naphthenic acids. Rapid Communications in Mass Spectrometry 22, 3909-3927. [doi: 10.1002/rcm.3806]. Belt, S.T., Massé, G., Rowland, S.J., Poulin, M., Michel, C. and LeBlanc, B. (2007) A novel chemical fossil of palaeo sea ice: IP25. Organic Geochemistry 38, 16-27. [doi: 10.1016/j.orggeochem.2006.09.013]. Lutnaes, B.F., Krane, J., Smith, B.E. and Rowland, S.J. (2007) Structure elucidation of C80, C81 and C82 isoprenoid tetraacids responsible for naphthenate deposition in crude oil processing. Organic & Biomolecular Chemistry 5, 1873-1877. [doi: 10.1039/b701462g]. Scarlett A., Canty M.N., Smith E.L., Rowland S.J. and Galloway T.S. (2007) Can amphipod behaviour help to predict chronic toxicity of sediments? Human and Ecological Risk Assessment 13, 1-13. [doi: 10.1080/10807030701341035]. Scarlett, A., Galloway, T.S. and Rowland, S.J. (2007) Chronic toxicity of unresolved complex mixtures (UCM) of hydrocarbons in marine sediments. Journal of Soils & Sediments 7, 200-206. [doi: 10.1065/jss2007.06.232]. Scarlett, A., Rowland, S.J., Canty, M., Smith, E.L. and Galloway, T.S. (2007) Method for assessing the chronic toxicity of marine and estuarine sediment-associated contaminants using the amphipod Corophium volutator. Marine Environmental Research 63, 457-470. [doi: 10.1016/j.marenvres.2006.12.006]. Teuten, E.L., Rowland, S.J., Galloway, T.S. and Thompson, R.C. (2007) Potential for plastics to transport hydrophobic contaminants. Environmental Science & Technology 41, 7759-7764. [doi: 10.1021/es071737s]. Aranami, K., Rowland, S.J. and Readman, J.W. (2006) Discriminating biogenic and anthropogenic chlorinated organic compounds using multi-isotope analyses of individual compounds. In: International Conference on Isotopes in Environmental Studies (Eds. Povinec, P.P. and Sanchez-Cabeza, J.A.). Radioactivity in the Environment 8, 24-38. Belt, S.T., Massé, G., Rowland, S.J. and Rohmer, M. (2006) Highly branched isoprenoid alcohols and epoxides in the diatom Haslea ostrearia Simonsen. Organic Geochemistry 37, 133-145. [doi: 10.1016/j.orggeochem.2005.10.005]. Reineke, V., Rullkötter, J., Smith, E.L. and Rowland, S.J. (2006) Toxicity and compositional analysis of aromatic hydrocarbon fractions of two pairs of undegraded and biodegraded crude oils from the Santa Maria (California) and Vienna basins. Organic Geochemistry 37, 1885-1899. [doi: 10.1016/j.orggeochem.2006.07.017]. Scarlett, A., Canty, M., Nilsson, J., Smith, E.L., Rowland, S.J. and Galloway, T.S. (2005) Comparative toxicity of two oil dispersants, Superdispersant-25 and Corexit 9527, to a range of coastal species. Environmental Toxicology and Chemistry 24, 1219-1227. [doi: 10.1897/04-334R.1]. Crowe, T., Smith, E.L., Donkin, P., Barnaby, D. and Rowland, S.J. (2004) Measurements of sublethal effects on individual organisms indicate community-level impacts of pollution. Journal of Applied Ecology 4, 114-123. [doi: 10.1111/j.1365-2664.2004.00882.x]. Massé, G., Belt, S.T., Allard, W.G., Lewis, C.A., Wakeham, S.G. and Rowland, S.J. (2004) Occurrence of novel monocyclic alkenes from diatoms in marine sedimenting particles and sediments. Organic Geochemistry 35, 813-822. [doi: 10.1016/j.orggeochem.2004.03.004]. Massé, G., Belt, S.T. and Rowland, S.J. (2004) Biosynthesis of unusual monocyclic alkenes by the diatom, Rhizosolenia setigera (Brightwell). Phytochemistry 65, 1101-1106. [doi: 10.1016/j.phytochem.2004.02.019]. Massé, G., Belt, S.T., Rowland, S.J. and Rohmer, M. (2004) Isoprenoid biosynthesis in the diatoms Rhizosolenia setigera (Brightwell) and Haslea ostrearia (Simonsen). Proceedings of the National Academy of Sciences of the United States of America 101, 4413-4418. [doi: 10.1073/pnas.0400902101]. Sinninghe Damsté, J.S., Muyzer, G., Abbas, B., Rampen, S.W., Massé, G., Allard, W.G., Belt, S. T., Robert, J.-M., Rowland, S. J., Moldowan, J.M., Barbanti, S.M., Fago, F.J., Denisevich, P., Dahl, J., Trinidade, L.A.F., and Schouten, S. (2004) The rise of rhizosolenid diatoms. Science 304, 584-587. [doi: 10.1126/science.1096806]. Thompson, R.C., Olsen, Y., Mitchell, R., Davis, A., Rowland, S.J., John, A.W.G., McGonigle, D., and Russell, A.E. (2004) Lost at sea: Where does all the plastic go? Science 304, 838. [doi: 10.1126/science.1094559]. Donkin, P., Smith, E.L. and Rowland, S.J. (2003) Toxic effects of unresolved complex mixtures of aromatic hydrocarbons accumulated by mussels, Mytilus edulis, from contaminated field sites. Environmental Science and Technology 37, 4825-4830. Belt, S.T., Massé, G., Allard, W.G., Robert, J.-M. and Rowland, S.J. (2002) Effects of auxosporulation on distributions of C25 and C30> isoprenoid alkenes in Rhizosolenia setigera. Phytochemistry 59, 141-149. McCormack, P., Jones, P. and Rowland, S.J. (2002) Liquid chromatography/electrospray ionisation mass spectrometric investigations of imidazoline corrosion inhibitors in crude oils. Rapid Communications in Mass Spectrometry 16, 705-712. [doi: 10.1002/rcm.625]. O'Connor, G., Rowland, S.J. and Evans, E.H. (2002) Evaluation of gas chromatography coupled with low pressure plasma source mass spectrometry for the screening of volatile organic compounds in food. Journal of Separation Science 25, 839-846. Allard, W.G., Belt, S.T., Massé, G., Naumann, R., Robert, J.-M. and Rowland, S.J. (2001) Tetra-unsaturated sesterterpenoids (Haslenes) from Haslea ostrearia and related species. Phytochemistry 56, 795-800. Belt, S.T., Allard, W.G., Massé, G., Robert, J.-M. and Rowland, S.J. (2001) Structural characterisation of C30 highly branched isoprenoid alkenes (rhizenes) in the marine diatom Rhizosolenia setigera. Tetrahedron Letters 42, 5583-5585. Belt, S.T., Massé, G., Allard, W.G., Robert, J.-M. and Rowland, S.J. (2001) Identification of a C25 highly branched isoprenoid triene in the freshwater diatom Navicula sclesvicensis. Organic Geochemistry 32, 1169-1172. Belt, S.T., Massé, G., Allard, W.G., Robert, J.-M. and Rowland, S.J. (2001) C25 highly branched isoprenoid alkenes in planktonic diatoms of the Pleurosigma genus. Organic Geochemistry 32 1271-1275. Kiriakoulakis, K., Stutt, E., Rowland, S.J., Vangriesheim, A., Lampitt, R.S. and Wolff, G.A. (2001) Controls on the organic chemical composition of settling particles in the Northeast Atlantic Ocean. Progress in Oceanography 50, 65-87. Massé, G., Poulin, M., Belt, S.T., Barreau, A., Robert, J.-M., Rincé, Y. and Rowland, S.J. (2001) A simple method for SEM examination of sectioned diatom frustules. Journal of Microscopy-Oxford 204, 87-92. Massé, G., Rince, Y., Cox, E.J., Allard, G., Belt, S.T. and Rowland, S.J. (2001) Haslea salstonica sp. nov. and Haslea pseudostrearia sp. nov. (Bacillariophyta), two new epibenthic diatoms from the Kingsbridge estuary, United Kingdom. Comptes Rendus de l'Academie des Sciences Serie III-Sciences de la Vie 324, 617-626. McCormack, P., Jones, P., Hetheridge, M.J. and Rowland, S.J. (2001) Analysis of oilfield produced waters and production chemicals by electrospray ionisation multi-stage mass spectrometry (ESI-MSn). Water Research 35, 3567-3578. [doi: 10.1016/S0043-1354(01)00070-7]. Niven, S.J., Snape, J., Hetheridge, M., Evans, M., McEvoy, J. and Rowland, S.J. (2001) Investigations of cholesterol transformation during sewage treatment: relevance to estrogen formation pathways? Science of the Total Environment 279, 75-86. Niven, S.J., Snape, J., Hetheridge, M., Evans, M., McEvoy, J., Sutton, P.G. and Rowland, S.J. (2001) Investigations of the origins of estrogenic A-ring aromatic steroids in UK sewage treatment works effluents. Analyst (London) 126, 285-287. Rowland, S.J., Allard, W.G., Belt, S.T., Massé, G., Robert, J.-M., Blackburn, S., Frampton, D., Revill, A.T. and Volkman, J.K. (2001) Factors influencing the distributions of polyunsaturated terpenoids in the diatom, Rhizosolenia setigera. Phytochemistry. 58, 717-728. Rowland, S.J., Belt, S.T., Wraige, E.J., Massé, G., Roussakis, C. and Robert, J.-M. (2001) Effects of temperature on polyunsaturation in cytostatic lipids of Haslea ostrearia. Phytochemistry 56, 597-602. Rowland, S., Donkin, P., Smith, E. and Wraige, E. (2001) Aromatic hydrocarbon 'humps' in the marine environment: unrecognized toxins? Environmental Science and Technology 13, 2640-2644. Smith, E., Wraige, E., Donkin, P. and Rowland, S. (2001) Hydrocarbon humps in the marine environment: Synthesis, toxicity and aqueous solubility of monaromatic compounds. Environmental Toxicology and Chemistry 20, 2428–2432. Belt, S.T., Allard, W.G., Massé, G., Robert, J.-M. and Rowland S.J. (2000) Highly branched isoprenoids (HBIs): Identification of the most common and abundant sedimentary isomers. Geochimica et Cosmochimica Acta 64, 3839-3851. Belt, A.T., Allard, G., Massé, G., Robert, J.-M. and Rowland, S.J. (2000) Important sedimentary sesterterpenoids from the diatom Pleurosigma intermedium. Chemical Communications, 501-502. Belt, S.T., Allard, W.G., Rintatalo, J., Johns, L.A., van Duin, A.C.T. and Rowland, S.J. (2000) Clay and acid catalysed isomerisation and cyclisation reactions of highly branched isoprenoid alkenes: implications for sedimentary reactions and distributions. Geochimica et Cosmochimica Acta 64, 3337-3345. Johns, L., Belt, S., Lewis, C.A., Rowland, S., Massé, G., Robert, J.-M. and König, W.A. (2000) Configurations of polyunsaturated sesterterpenoids from the diatom, Haslea ostrearia. Phytochemistry 53, 607-611. Glegg, G.A., Hickman, L. and Rowland, S.J. (1999) Contamination of limpets (Patella vulgata) following the Sea Empress oil spill. Marine Pollution Bulletin 38, 119-125. Johns, L., Wraige, E.J., Belt, S.T., Lewis, C.A., Massé, G., Robert, J.-M. and Rowland, S.J. (1999) Identification of a C25 highly branched isoprenoid (HBI) diene in Antarctic sediments, sea-ice diatoms and cultured diatoms. Organic Geochemistry 30, 1471-1475. Stutt, E., Pan, G., Sturt, H., McCormack, P., Herzl, V., Millward, G. and Rowland, S.J. (1999) Fate of oil production chemicals in seawater: Reactivity of organic constituents in produced waters. 19th International Meeting on Organic Geochemistry, Istanbul, Turkey, 6-10 September 1999, Abstracts Part 1, PB55, Tubitak Marmara Research Center, 431-432. Wraige, E.J., Johns, L., Belt, S.T., Massé, G., Robert, J.-M. and Rowland, S. (1999) Highly branched C25 isoprenoids in axenic cultures of Haslea ostrearia. Phytochemistry 51, 69-73. [doi: 10.1016/S0031-9422(98)00694-3]. Zhou, J.L., Fileman, T.W., Evans, S., Donkin, P., Readman, J.W., Mantoura, R.F.C. and Rowland, S. (1999) The partition of fluoranthene and pyrene between suspended particles and dissolved phase in the Humber Estuary: a study of the controlling factors. Science of the Total Environment 243/244, 305-321. Belt, S.T., Rowland, S. and Scaiano, J.C. (1998) Rate constants for the abstraction of hydrogen from alkyl aromatics by alkoxyl radicals and excited state ketones: relevance to the photodegradation of the water-soluble fraction of crude oil. Marine Chemistry 61, 157-162. Cooke, D.A., Barlow, R., Green, J., Belt, S.T. and Rowland, S.J. (1998) Seasonal variations of highly branched isoprenoid hydrocarbons and pigment biomarkers in intertidal sediments of the Tamar estuary, UK. Marine Environmental Research 45, 309-324. Pearce, R.B., Kemp, A.E.S., Koizumi, I., Pike, J., Cramp, A., Wraige, E.J. and Rowland, S. J. (1998) A lamina-scale, SEM-based study of a late Quaternary diatom-ooze sapropel from the Mediterranean ridge, Site 971. Proceedings ODP, Scientific Results, 160. College Station, TX (ODP), 333-348. Rullkotter, J., Rinna, J., Bouloubassi, I., Scholz-Boettcher, B.M., Meyers, P.A., Johns, L. and Rowland, S.J. (1998) Biological marker significance of organic matter origin and transformation in sapropels from the Pisano Plateau, Site 964. Proceedings ODP, Scientific Results, 160. College Station, TX (ODP), 271-284. [doi: 10.2973/odp.proc.sr.160.023.1998]. Wraige, E.J., Belt, S.T., Massé, G., Robert, J.-M. and Rowland, S.J. (1998) Variations in distributions of C25 highly branched isoprenoid (HBI) alkenes in the diatom, Haslea ostrearia: influence of salinity. Organic Geochemistry 28, 855-859. Zhou, J.L., Fileman, T.W., Evans, S., Donkin, P., Llewellyn, C., Readman, J.W., Mantoura, R.F.C. and Rowland, S.J. (1998) Fluoranthene and pyrene in the suspended particulate matter and surface sediments of the Humber estuary, UK. Marine Pollution Bulletin 36, 587-597. Read, P., Beere, H., Ebdon, L., Leizers, M., Hetheridge, M. and Rowland, S. (1997) Gas chromatography-microwave-induced plasma mass spectrometry (GC-MIP-MS): a multi-element analytical tool for organic geochemistry. Organic Geochemistry 26, 11-17. Zhou, J.L. and Rowland, S.J. (1997) Evaluation of the interactions between hydrophobic organic pollutants and suspended particles in estuarine waters. Water Research 31, 1708-1718. Zhou, J.L. and Rowland, S.J. (1997) The sorption of hydrophobic pyrethroid insecticides to estuarine particles: a compilation of recent research. In Biogeochemistry of Intertidal Sediments. (T. Jickells & J. Rae, eds). Cambridge University Press. Zhou, J.L., Rowland, S.J., Mantoura, R.F.C. and Lane, M.C.G. (1997) Desorption of tefluthrin insecticide from soil in simulated rainfall runoff systems-kinetic studies and modelling. Water Research 31, 75-84. Belt, S.T., Cooke, D.A., Robert, J.-M. and Rowland, S. (1996) Structural characterization of widespread polyunsaturated isoprenoid biomarkers: a C25 triene, tetraene and pentaene from the diatom Haslea ostrearia Simonsen. Tetrahedron Letters 37, 4755-4758. Zhou, J.L., Fileman, T.W., Evans, S., Donkin, P., Mantoura, R.F.C. and Rowland, S.J. (1996) Seasonal distribution of dissolved pesticides and polynuclear aromatic hydrocarbons in the Humber Estuary and Humber coastal zone. Marine Pollution Bulletin 32, 599-608. 2012 The Environment Agency, Exeter, U.K.
2011 Oil Plus Ltd., U.K.
With Professor Tamara Galloway (School of Biosciences, University of Exeter). 2008 Oil Plus Ltd., U.K.
With Professor Hilary Lappin-Scott (EMERGE, University of Exeter). 2000 Plymouth Marine Laboratory, U.K.
2001 Woods Hole Oceanographic Institution, U.S.A.
1999 University of Nottingham, U.K.
2001 AstraZeneca, Brixham Environmental Laboratories, Brixham, U.K.
1999 British Maritime Technology (Information Systems) Ltd., U.K.
Can micropollutants cause harm in the marine environment? Lost at sea: Where do all the plastics go? C&EN (Chemistry & Engineering News) , 7 March 2017, Fractious fractions teased from crude oil. C&EN (Chemistry & Engineering News) , 28 September 2015, Scientists tentatively identify bird-killing goo in San Francisco Bay. BBC website, 6 February 2013 Seabird deaths substance 'identified as oil substance'. BBC website, 16 April 2013 'Sticky' birds death agent 'should be reclassified'. Guardian website, 6 February 2013 Oil additive polymer PIB may be responsible for seabird deaths. Chemistry World, May 2011, page 9, Monitoring Oil Sand Toxicity. Plymouth Evening Herald, 11 January 2008, Winner Captialises on Success. The Dan Rather Reports, November/December 2007, A Crack in the Ice (see from about 7 minutes 20 seconds). BBC Ten O'Clock News (e.g. see Polar Bears in the Arctic Region). Plymouth Evening Herald, 17 November 2007, Business Class. Western Morning News (Devon), 3 November 2007, page 30, Ice Research May Help Predict Climate Change. BBC website, 15 October 2007, Arctic Muds Reveal Sea Ice Record. British Mass Spectroletry Society: Environmental and Food Analysis Special Interest Group, Southampton, U.K., 20 July 2017 (opening keynote oral). 20th Australian Organic Geochemistry Conference, Fremantle, WA, Australia, 5-7 December 2016 (plenary oral). 12th International Conference on Paleoceanography, Utrecht, Netherlands, 29 August-2 September 2016 (poster, colleague). Petrophase 2016, The 17th International Conference on Petroleum Phase Behavior and Fouling, Elsinore, Denmark, 19-23 June 2016 (invited keynote oral; poster, colleague). 40th International Symposium on Capillary Chromatography and 13th GC×GC Symposium, Riva del Garda, Italy, 29 May-3 June 2016 (invited oral; poster, colleague). SETAC Europe 26th Annual Meeting, Nantes, France, 22-26 May 2016 (oral, colleague). 26th Annual Meeting of the British Organic Geochemical Society, Glasgow, U.K., 2-3 July 2015 (poster, colleague). 27th International Meeting on Organic Geochemistry, Prague, Czech Republic, 13-18 September 2015 (plenary oral; plenary oral, colleague; poster, colleague). New Developments in the Analysis of Complex Environmental Matrices, Royal Society of Chemistry, Burlington House, London, U.K., 6 February 2015 (invited oral). SETAC North America 35th Annual Meeting, Vancouver, BC, Canada, 9-13 November 2014 (2 orals, colleague; 2 posters1,2, colleague). Gordon Research Conference, Organic Geochemistry, Holderness School, Holderness, NH, U.S.A., 3-8 August 2014 (poster/invited poster oral, colleague). 25th Annual Meeting of the British Organic Geochemical Society, Liverpool, U.K., 10-11 July 2014 (invited plenary). SETAC 24th Europe Annual Meeting, Basel, Switzerland, 11-15 May 2014 (oral, colleague; poster, colleague). 13th International Symposium on Hyphenated Techniques in Chromatography and Hyphenated Chromatographic Analyzers (HTC-13) & Third International Symposium on Hyphenated Techniques for Sample Preparation (HTSP-3), Bruges, Belgium, 28-31 January 2014 (oral, colleague). 26th International Meeting on Organic Geochemistry, Tenerife, Spain, 15-20 September 2013 (oral, colleague). 24th Annual Meeting of the British Organic Geochemical Society, Plymouth, U.K., 10-11 July 2013 (oral, colleague; 2 posters, colleage). 37th International Symposium on Capillary Chromatography and 10th GC×GC Symposium, Palm Springs, U.S.A., 12-16 May 2013 (invited plenary). SETAC 23rd Europe Annual Meeting, Glasgow, U.K., 12-16 May 2013 (2 orals, colleague; poster, colleague). SETAC North America 33rd Annual Meeting, Long Beach, U.S.A., 11-15 November 2012 (oral, colleague). Oceans of Potential, Plymouth, U.K., 11-12 September 2012 (poster, colleague). 36th International Symposium on Capillary Chromatography and 9th GCxGC Symposium, Riva del Garda, Italy, 27 May-1 June 2012 (poster, colleague). SETAC 6th World Congress/SETAC Europe 22nd Annual Meeting, Berlin, Germany, 20-24 May 2012 (2 orals, colleague; 2 posters1, 2, colleague). SETAC North America 32nd Annual Meeting, Boston, U.S.A., 13-17 November 2011 (oral, colleague; poster, colleague). Priority Substances Monitoring & Occurrences in the Environment: The Future Challenges for PBTs in Surface & Groundwaters, Dublin, Eire, 20 September 2011 (oral, colleague). 25th International Meeting on Organic Geochemistry, Interlaken, Switzerland, 18-23 September 2011 (oral; 2 posters, colleague). 22nd Annual Meeting of the British Organic Geochemical Society, Swansea, U.K., 6-7 July 2011 (oral, colleague). SETAC Europe 21st Annual Meeting, Milan, Italy, 15-19 May 2011 (2 orals, colleague; poster, colleague). 49th Annual Conference of the Ussher Society, Bideford, U.K. 5 January 2011 (The Scott Simpson Lecture, invited oral). SETAC North America 31st Annual Meeting, Portland, U.S.A., 7-11 November 2010 (oral). 21st Annual Meeting of the British Organic Geochemical Society, Manchester, U.K., 6-7 July 2010 (2 orals, colleague). 34th International Symposium on Capillary Chromatography and 7th GC×GC Symposium, Riva del Garda, Italy, 30 May-4 June 2010 (4 posters1, 2, 3, 4, colleague). SETAC Europe 20th Annual Meeting, Seville, Spain, 23-27 May 2010. poster. 24th International Meeting on Organic Geochemistry, Bremen, Germany, 6-11 September 2009 (plenary oral; 3 posters1, 2, 3, colleague). 2nd International Conference on Applied Microbiology and Molecular Biology in Oil Systems, Aarhus, Denmark, 17-19 June 2009 (oral, colleague). American Geophysical Union Fall Meeting 2008, San Francisco, U.S.A., 15-19 December 2008 (oral, colleague). Australian Organic Geochemistry Conference, Adelaide, Australia, 8-11 September 2008 (invited plenary). 163rd Meeting of the Society for General Microbiology, Dublin, Eire, 8-11 September 2008 (oral, colleague; poster, colleague). 5th SETAC World Congress, Sydney, Australia, 3-7 August 2008 (poster, colleague). 2nd Norwegian Environmental Toxicology Symposium, Trondheim, Norway, 2-4 April 2008 (oral, colleague). EGU General Assembly 2008, Vienna, Austria, 13-18 April 2008 (oral, colleague). 162nd Meeting of the Society for General Microbiology, Edinburgh, U.K., 31 March-3 April 2008 (poster, colleague). Chemistry in the Oil Industry X Oilfield Chemistry: The Solution or the Challenge? Manchester, U.K., 5-7 November 2007 (oral, colleague). 23rd International Meeting on Organic Geochemistry, Torquay, U.K., 9-14 September 2007 (plenary oral; 2 orals, colleague; 4 posters1, 2). 5th IWA Specialised Conference on Assessment and Control of Micropollutants/Hazardous Substances in Water (MICROPOL & ECOHAZARD 2007), Frankfurt/Main, Germany, 17-20 June 2007 (oral). 8th International Conference on Petroleum Phase Behavior and Fouling, Pau, France, 10-14 June 2007 (oral, colleague). SETAC Europe 17th Annual Meeting, Porto, Portugal, 20-24 May 2007 (2 posters1, 2, colleague). Vice Chancellor's Research and Innovation Conference, Plymouth, U.K., 4 April 2007 (poster; colleague) . 160th Meeting of the Society for General Microbiology, Manchester, U.K., 26-29 March 2007 (poster, colleague). International Conference on Analysis of Emerging Contaminants in the Environment (EmCon 2007), York, U.K., 7-9 March 2007 (oral, colleague). Arctic Net 3rd Annual Scientific Meeting. Victoria, Canada, 12-15 December 2006 (poster; colleague). American Geophysical Union. San Francisco U.S.A., 11-15 December 2006 (poster; colleague). Royal Society of Chemistry: Environmental Forensics. Durham, U.K., 18-21 September 2006 (invited keynote oral). 11th International Symposium on Microbial Ecology (ISME-11), Vienna, Austria, 20-25 August 2006 (oral, colleague; poster, colleague). 18th Annual Meeting of the British Organic Geochemical Society, Milton Keynes, U.K., 28-29 June 2006 (3 posters, colleague). HOLIVAR2006 Natural Climate Variability and Global Warming UCL, London, U.K., 12-15 June 2006 (poster, colleague). 158th Meeting of the Society for General Microbiology, Warwick, U.K., 3-6 April 2006 (poster, colleague). European Geosciences Union (EGU) General Assembly, Biogeosciences, Vienna, Austria, 2-7 April 2006 (invited oral). Los Martes de L'Oceanografic Lectures, Ciudad de las Artes y Las Ciencias de Valencia, Valencia, Spain, 21 February 2006 (oral, colleague). 9th Hyphenated Techniques in Chromatography Symposium, York, U.K., 8-10 February 2006 (poster, colleague). Ussher Society, 44th Annual Conference, Bideford, U.K., 3-5 January 2006 (invited oral). 2nd Annual ArcticNet Scientific Meeting (ASM2005), Banff, Canada, 13-16 December 2005 (poster, colleague). ESF Exploratory Workshop - Life, Environmental and Earth Sciences (LESC), Delmenhorst, Germany 12-16 December 2005 (invited oral and poster). Geological Society Meeting, London, U.K., 3-4 October 2005 (oral). 22nd International Meeting on Organic Geochemistry, Seville, Spain, 12-16 September 2005 (poster, colleague). Goldschmidt Geochemistry conference, Copenhagen, Denmark, 5-11 June 2004 (invited oral). SETAC Europe 14th Annual Meeting, Prague, Czech Republic, 18-22 April 2004 (oral, colleague; 2 posters, colleague). Chemistry in the Oil Industry VIII, Manchester Conference Centre, U.K., 3-5 November 2003 (poster, colleague). 21st International Meeting on Organic Geochemistry, Krakow, Poland, 8-12 September 2003 (2 orals, colleagues; Chair session). International Meeting of Analytical Division of the Swiss Chemistry Society, Zurich, Switzerland, 3-5 September 2003 (invited oral). 5th Agilent Environmental Mass Spectrometry Meeting, Chester, U.K., 19-20 June 2003 (invited oral). 3rd European Meeting on Environmental Chemistry, Geneva, Switzerland, 11-14 December 2002 (2 orals, colleague; poster, colleague). William Smith and the Deep Biosphere, Geological Society, Burlington House, U.K., 22-23 October 2002 (oral). A.G. Douglas Symposium, Joint Meeting of the Canadian Society for Coal Science and Organic Petrology and The Society for Organic Petrology 19th TSOP Annual Meeting, The Banff Centre, Alberta, Canada, 31 August-4 September 2002 (invited oral). 23rd International Symposium on the Chemistry of Natural Products, Florence, Italy, 28 July-2 August 2002 (oral, colleague; poster). International Workshop on the Application of Normal Phase Fractionation in Effect Directed Identification Studies, The Hague, The Netherlands, 26 April 2002 (poster, colleague). SET for Britain: Young Scientists Meeting, The House of Commons, London, U.K., 18 March 2002 (poster, colleague). University of Sussex, Department of Environmental and Chemical Sciences, U.K., 1 November 2001 (seminar). University of Newcastle, Fossil Fuels Research Group, Newcastle, U.K., 25 September 2001 (seminar). 20th International Meeting on Organic Geochemistry, Nancy, France, 10-14 September 2001 (oral; poster; poster). 13th Annual Meeting of the British Organic Geochemistry Society, Gregynog, Wales, U.K., 23-25 July 2001 (poster). University of Bristol: Lecture Series, University of Bristol, Bristol, U.K., 4 June 2001 (invited oral). Natural Products Biology (BBSRC Invited Meeting), University of Warwick, Warwick, U.K., 20-21 May 2001 (invited poster). 8th Annual Meeting on the Cutting Edge: Organic Contaminants in Soils Sediment and Water, University of Reading, Reading, U.K., 1 May 2001 (oral). European Union of Geosciences, 11th meeting, Strasbourg, France, 8-12 April 2001 (oral). The Royal Society of Chemistry, Industrial Affairs Division: Energy Sector (Chemical Analysis in the Energy Industry), The Royal Society of Chemistry, Burlington House, London, U.K., 21 November 2000 (invited oral). 20th Goldschmidt International Conference on Geochemistry, Oxford, U.K., 3-7 September 2000 (Chairman: Biological Geochemistry). Symposium on Biological Chirality, Szeged, Hungary, 27-31 August 2000 (plenary oral, colleague). 16th International Diatom Symposium 2000, Athens, Greece, 25 August-1 September 2000 (poster). Gordon Research Conference, New Hampshire U.S.A., 13-18 August 2000 (invited oral). 12th Annual Meeting of the British Organic Geochemistry Society, Bristol U.K., 5-7 July 2000 (oral). Norwegian Organic Geochemical Society (NOGS) 7th Biennial Meeting, Stavanger, Norway, 7-9 June 2000 (oral). Third SETAC World Congress (Global Environmental Issues in the 21st Century: Problems, Causes and Solutions), Brighton, U.K., 21-25 May 2000 (oral, student - Awarded Procter & Gamble Eurocor Prize for best oral or poster presentation by a young scientist). Royal Society of Chemistry, Analytical Division Meeting, Warrington, U.K., 11-12 October 1999 (invited oral). International meeting on Marine Pollution, Barcelona, Spain, 29 September-1 October 1999 (invited oral). 19th International Meeting on Organic Geochemistry, Istanbul, Turkey, 6-10 September 1999 (Chairman: Biodegradation Processes). 19th International Meeting on Organic Geochemistry, Istanbul, Turkey, 6-10 September 1999 (oral; poster). 3rd Meeting on Progress in Chemical Oceanography, University of Plymouth, Plymouth, U.K., September 1999 (oral, colleague; poster, colleague). FACSS conference Vancouver, Canada September 1999 (poster, colleague). 17th Australian & New Zealand Society for Mass Spectrometry Conference, Thredbo Alpine Village, NSW, Australia, (oral, colleague). Stable Isotopes in Mass Spectrometry Meeting, University of Exeter, Exeter, U.K., January 1999 (poster). 1998 Biodiversity, Biotechnology and Biobusiness Conference, Perth, WA, Australia, 23-27 November, 1998 (oral, colleague). Conference Twenty years after Amoco Cadiz, Brest, Brittany France, 15-17 October 1998 (poster, colleague). Symposium on Biological Homochirality, Serramazzoni, Modena, Italy, 6-12 September 1998 (oral, colleague). Oceanography '98, Southampton, U.K., September 1998 (oral; poster). 9th International Symposium on Marine Natural Products, Townsville, Australia, July 1998 (oral; poster). Royal Australian Chemical Institute Lecture, Hobart, Australia, April 1998 (invited oral). Royal Australian Chemical Institute Lecture, Launceston, Australia, April 1998 (invited oral). 18th Annual meeting SETAC, San Francisco, U.S.A., 16-20 November 1997 (poster, colleague). 18th International Meeting on Advances in Organic Geochemistry, Maastricht, The Netherlands, 22-26 September 1997 (two posters). Department of Environment, Oestrogenic Chemicals in Environment, Leicester, U.K., May 1997 (invited oral). American Chemical Society, 213th International Meeting, San Francisco, U.S.A., April 1997 (invited oral).